Yeah yeah, I thought. I know why the kids like it: boys’ toys and gadgets, action scenes, mystery, slick dialogue, bam bam. Dismissing them out of hand in the same way I dismiss grown men’s love for 007, gladiator movies, Bourne identities, etc. Then my son went to hear Anthony Horowitz talk at the Southbank centre and came back inspired, and Walker Books contacted me about their relaunch for the brand, and I thought okay it’s time I read Alex Rider myself. Wow! Tightly plotted, niftily written, the first book in the series, Stormbreaker, zooms along like a rocket to its target. I felt compelled from the first sentence. It’s as exciting and unrealistic as you could ask for in this genre. I loved our hero, and how clever and skilful and cool he is. I loved the machinations of the ‘MI6’ set up and the elusive villains. It made me smile, and admire Horowitz’s skilful storytelling. For someone usually disdainful of such spy thrillers, this one was more than a pleasure from start to finish. 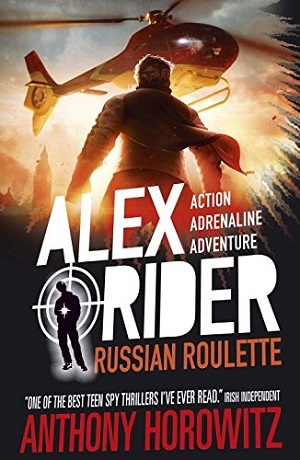 In this first adventure, Alex Rider is employed by MI6 precisely because he is a schoolboy, and can infiltrate the headquarters of Sayle Enterprises as the winner of a computer magazine competition to discover if there’s anything suspect about the line of computers, the Stormbreakers, which Sayle Enterprises are rolling out free to every school in the country. Of course, there is something highly suspect about Mr Sayle, not least his penchant for keeping a Portuguese Man ‘o War as his pet, and Alex Rider has to stop his deathly plan before it’s too late. What’s so pleasing is that the Alex Rider books are exactly what they say on the tin! From the corny filmic staplines on the back cover…”His first assignment may well be his last” to the spy gadgets bestowed upon Alex (the zit cream that melts metal), to the chapter headings, “Double O Nothing” and the exhilarating non-stop action – these are all the right ingredients for this genre of pacey thriller. But it’s the flawless perfection that Anthony Horowitz brings to the genre with his taut writing style and seemingly effortless imagination that make this a powerful and exemplary series. I fully intend to now read the rest. Alex Rider is a good series, which I really like because it is fun and exciting. It follows an orphaned teenage spy, recruited by MI6. Alex was brought up by his Uncle Ian and his housekeeper, Jack Starbright. Jack kept on living with him after Uncle Ian’s death. Alex later discovers that his parents and his uncle were all secretly spies and were all assassinated. One of my favourite books in the series is “Eagle Strike”. Alex is certain that Damian Cray, pop singer has got an evil plan after finding his phone number on an assassin’s mobile. MI6 don’t believe him and Alex sets out on his own to investigate. He travels to Holland to find Cray’s game console factory and finds out what ‘Eagle Strike’; Cray’s plot; is all about. I like it because it is exciting and there are lots of unexpected turns in the story. My favourite part is when Alex finds himself inside a deadly video game… in real life! What I like most in this series are the gadgets. They are fun and exciting to have. The gadget maker Smithers is a bald, fat, friendly man who is my favourite character. My favourite gadget is a calculator which can be used to contact MI6 and can also jam CCTV cameras. Gadgets play a big part in the books because they add excitement and help make them interesting and full of suspense. I love the Alex Rider series and hope to finish reading them all. For those of you who are yet to discover Alex Rider, luckily for you the whole series has been rebranded with covers designed by a video game designer, Two Dots, the studio who designed the packaging for Ubisoft’s video games Assassins Creed and Far Cry, and they suit the stories well. Clever spines highlight the number in the series, as well as spelling out Alex Rider when they are lined up on the shelf. To buy Stormbreaker, click here. There is also a new Alex Rider website, www.alexrider.com and you can even go on ‘spy training’ camp with the Youth Hostels Association.